In the quest to further our scuba training the question is Aquarium Dives: To count or not to count? The Master Scuba Diver and Divemaster qualifications require a minimum number of dives. So my obvious question was what constitutes a “dive”? Most of the major scuba certifying organizations only define standards for training dives, not recreational dives. However, most divers agree that a dive must be at least 20 feet for at least 20 minutes. While I am not yet a well traveled diver, I have had the opportunity to dive in 2 aquariums. My first aquarium dive was in the National Aquarium in Baltimore, MD to 13 ft for 45 minutes. Their Atlantic Coral Reef exhibit features over 400 fish, including 2 green moray eels. My second aquarium dive was the Epcot Dive Quest in Orlando to 25 feet for 45 minutes. The highlights were the Sand Tiger sharks and the Bowmouth Guitarfish. Both dives were amazing and provided me with experiences that I may not have had in an open water dive. Many divers do not think aquarium dives should count toward the required number of dives for certifications. Some believe these are not “real” dives because aquariums are controlled environments. Aquarium dives offer unique benefits to a diver. Like the ocean, they house many species of marine life. Unlike the ocean, the diver is guaranteed to experience interaction with the animals. Plus, most aquariums, as part of the dive experience, offer an in-depth educational presentation. All of these experiences add to the divers’ knowledge of the marine world. Diving in an aquarium is also a fantastic confidence builder. It offers new and inexperienced divers the opportunity to get scuba experience in a controlled environment. Aquariums mimic the water salinity and exposure to animal life of ocean diving. Also, Aquarium dives safely expose skittish divers to sea life. Spoiler alert: marine creatures are not going to eat you as soon as you enter the water! Aquarium diving reinforces good buoyancy and the rules of marine life interaction. The best part is that Aquarium dives allow non-diving friends and family to share in the awesomeness of scuba diving. Recently, I had my second dive in the National Aquarium for the express purpose of showing my daughter’s friend how cool scuba is. After seeing me in the tank, she is pumped to get certified. The most important point I want to make is that any time a diver is underwater and performing scuba skills they are adding to their overall experience. I would agree that jumping in a pool and sitting on the bottom for 20 minutes is not really “experience”. Aquarium dives are not that. Divers must interact with marine life and use their scuba skills just like in an open water environment (sometimes even better). 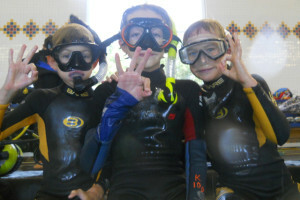 If experience is the main goal for the prerequisite dives, aquarium dives provide that and more. Robert is a very new scuba diver, earning his Open Water certification in February of 2017. He has since earned his Advanced Open Water, Rescue Diver, and various specialty certifications. Robert plans to begin Divemaster training in the spring/summer of 2018 and, as a result, will make scuba diving his next career. Great blog. I agree that aquarium dives should be counted. Yes, an aquarium dive is within a controlled environment however, just as you do in open water dives, you use the same dive equipment, practice proper dive skills and in some ways, it is more challenging with buoyancy in an environment that can range (depending on the aquarium between 12’ and 30’). Having dove many aquariums, with plans to dive more, I think those dives offer unique experiences that often times you can’t experience in the open water. Robert, I have to agree with you and Brian, that aquarium dives should count towards certification as long as they meet the minimum requirements for skills time and depth. We often certify divers in confined locations such as quarries. So why not aquariums? As for the depth of a dive I have to say I disagree with anyone who sets a certain depth as a hard and fast rule for a dive to count. yes bobbing in and out of the water three times in a row should not be counted as a repet dive but I think any dive sustained for more than 10 minutes should be considered as a dive. Here’s an example. on a working dive I dove to a depth of 10 feet and stayed there for four hours, changing out scuba bottles as needed. During another dive I stayed between 14 and 18 feet for 14 hours. so if the hard and fast rule of 20 feet plus were to count my dives would not be valid and would not qualify as a dive. Believe me they counted. Good blog Robert. It’s your logbook, log what you want. i’ve done plenty of boat dives in log island sound plus a few more on reefs, and learned a lot doing them, that probably were not technically dives by the 20-20 rule. padi does allow open water training dives as shallow as 15 feet in “(very large aquariums and specifically-constructed environments designed for recreational diving, for example) that provide conditions typically associated with natural bodies of water.” however, if padi or your instructor doesn’t want to count those dives towards divemaster or master diver its easier and more fun just to do some more dives than try to buck the system. While i agree that aquarium dives are CHALLENGING dives that require the same elements and skills that are used in open water dives (such as great BUOYANCY control, interaction with marine life, and proper usage of scuba equipment and scuba skills, i do not think that aquarium dives should count towards the required dives for certification. it’s not that they are not “real” dives. but dives in a controlled environment such as an aquarium are undoubtedly easier than open water dives, both mentally and PHYSICALLY, and therefore while they do in fact have their own set of CHALLENGES, these challenges are in my opinion of a lesser degree than the CHALLENGES presented by an open water dive.